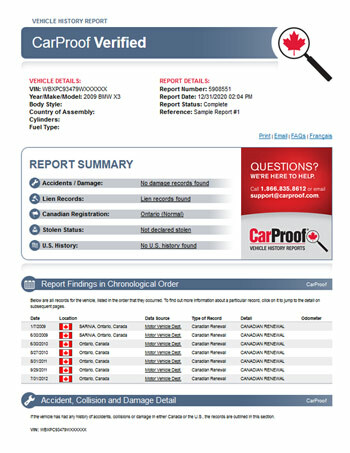 CarProof’s fully bilingual vehicle history reports rely on accurate and live real-time data to provide you with a complete history of the vehicle including critical accident information, cross-Canada lien search information and full U.S. history. We already purchase a CarProof report for every vehicle that comes through our doors, we offer it to you so you can get full details on the vehicle’s history. We want to make your car buying experience as transparent as possible so we go the extra mile to make sure every step is done properly. WHAT’S SO SPECIAL ABOUT A CARPROOF REPORT? CarProof is electronically connected on a real-time (“live”) basis to its data sources. This means that the data is always current and not outdated. Other services purchase data dumps periodically, leaving the chance that recent important data is not included in their reports. CarProof provides consumers with Canadian lien and/or security interest information on vehicles from right across Canada and guarantees the results. CarProof is connected live to each provincial and territorial registrar responsible for maintaining these records. Other U.S.-based services (including CARFAX), do not report any Canadian vehicle lien information. CarProof provides data from Canada's private and public insurers. For vehicles in or from British Columbia, CarProof VERIFIED BC reports provide additional claims information directly from the Insurance Corporation of British Columbia (ICBC) database. In addition to all of the above, CarProof reports also provide consumers with data from one of the largest U.S.-based vehicle history services, Experian Automotive. Through their live connection to Experian’s 2 billion+ record database, all CarProof reports include the data you would get from other popular U.S.-based vehicle history services, including a Lemon Search.